Different cultures around the world have a mythical animal that is a dragon, or that it much like a dragon. All these types of creatures have a different significance and symbolism around them. In western countries in Europe the dragon is looked down upon. In these countries the dragon is a dinosaur-like creature with wings. They love to cause trouble, murder, and steal. However, the dragon is not always seen this way in other countries. In Asian countries, China especially, the dragon looks and is symbolized much differently. These dragons are not likely to breathe fire, they don’t have wings, and they look much more like snakes than dinosaurs. These dragons are generally seen to be benevolent and kind, even lucky! 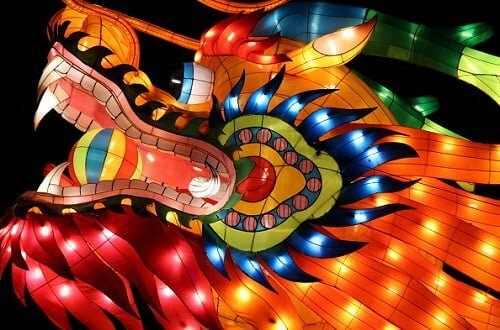 This article will discuss nine different types of Chinese dragons and their importance in the dragon myth. There are nine major types of dragons in Chinese mythology. Nearly all Chinese dragons fall into one of these nine categories. The Dragon King is usually thought of as the last type of dragon. It is thought that this dragon is so powerful that it needs to be made up of four other dragons to function. These four dragons rule the four seas near China. The homeless dragon lives in the oceans. It sometimes goes by the name Il. The horned dragon was thought to be the most powerful dragon in Chinese mythology. This doesn’t mean that it was evil though. This kind of dragon could also be called “Lung.” This dragon, as powerful as it was, was deaf. The horned dragon could also make it rain at will. It was strange for Chinese dragons to be depicted with wings, so this is a unique type of winged dragon. There is not much else that is special about it though. This type of dragon was highly important in Chinese mythology. This dragon also can be called the “T’ien Lung” dragon. This dragon lives in the sky. It is this dragon’s job to protect the gods that live in the sky to make sure that they do not fall down to earth. This dragon is in control of a couple of the elements: wind and rain. It is this dragon’s job to take care of these elements and use them for the human’s benefit. This dragon lives in the water. It could have very easily inspired stories of sea monsters. Yellow is a highly symbolic color in Chinese symbolism. It has a lot to do with luck and power. This dragon was also said to have introduced Chinese writing to the ancient Emperor Fu Shi. This dragon also lives in the water. Like many western dragons, this dragon was also said to hoard and protect treasures or other kinds of wealth or money. It was like a giant magical guard-dog. All these types of dragons contributed to Chinese mythology. Symbols of these dragons can be found on many objects in China like gongs, bells, fiddles and other instruments, tables, books, temples and other monuments, bridges, swords, and anything else you might be able to think of. Having a symbol of a Chinese dragon around you is said to bring good luck, prosperity, happiness, and sometimes wealth.